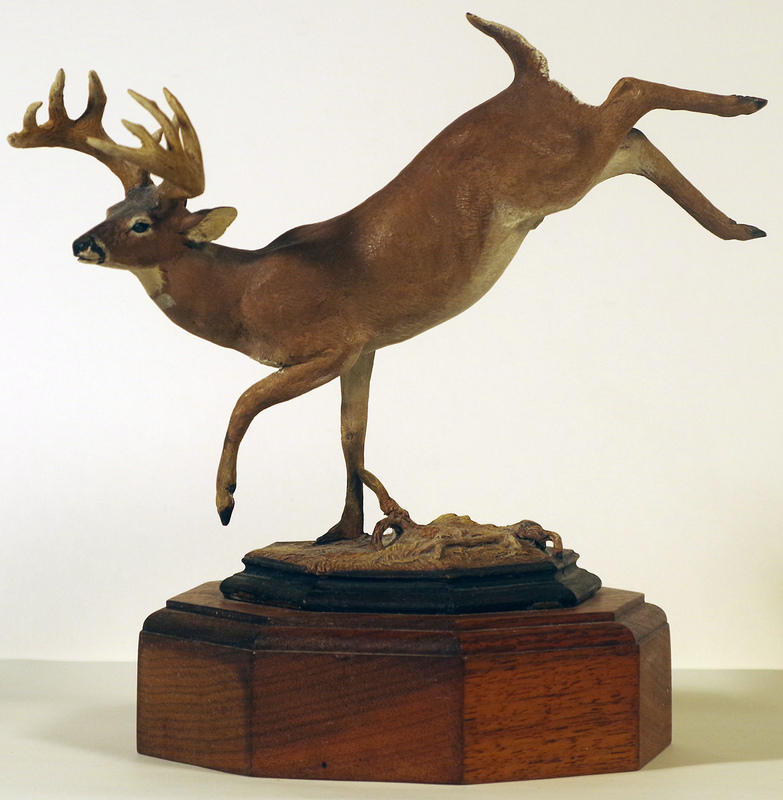 Art - Sportsman's Legacy, Fine firearms, related books and sporting collectibles. Representing estates, collectors and nonprofit conservation organizations. 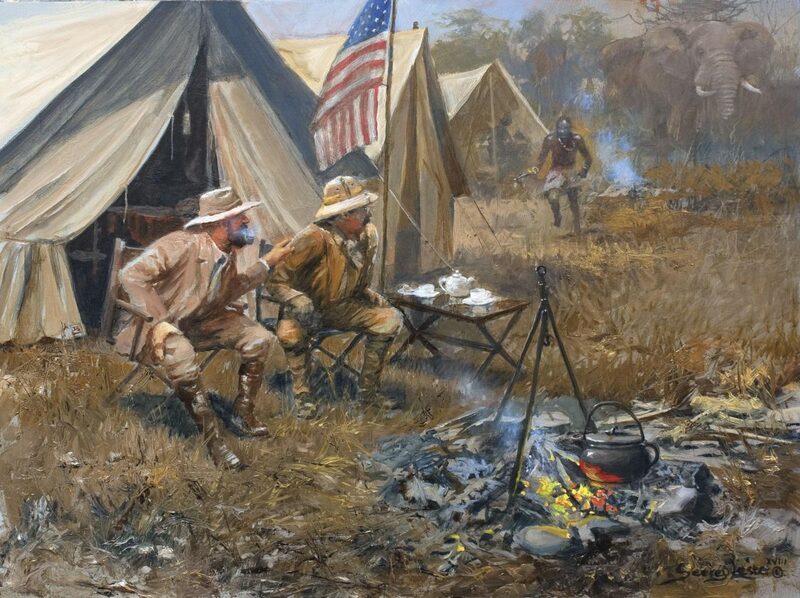 Those who appreciate fine sporting arms often acquire other interesting items to remind them of special times afield or contribute to the enjoyment of a planned adventure. These treasures usually return to the market in conjunction with a collection of firearms. 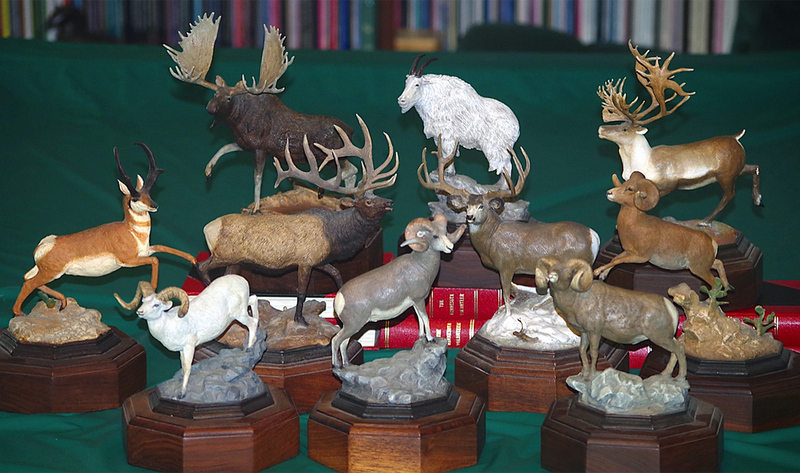 Accordingly, Sportsman’s Legacy is pleased to offer a selection of wildlife and sporting art, fine books and sporting collectibles for consideration. 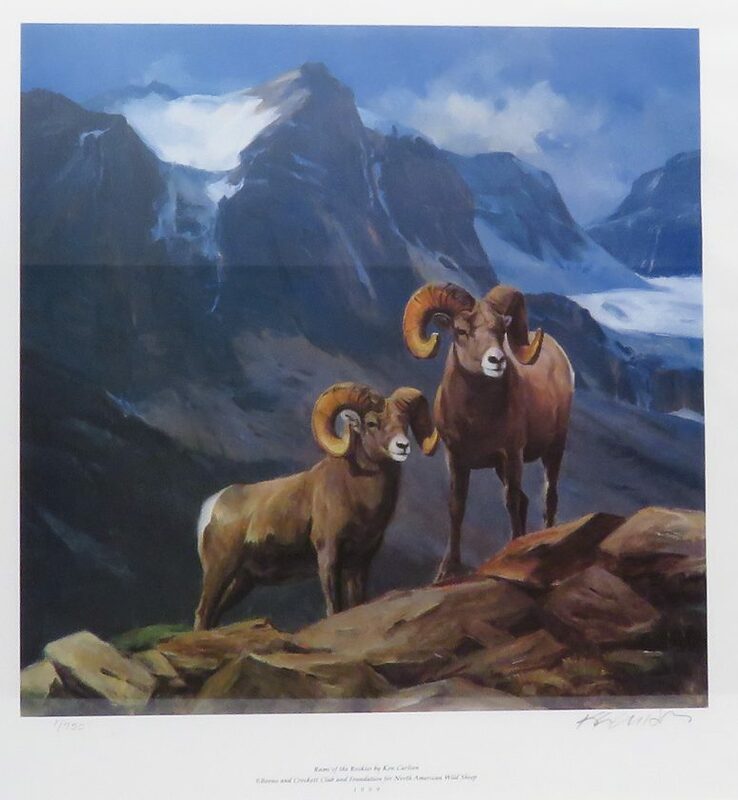 Rams of the Rockies by Ken Carlson, this particular framed print being the number one (1/750) created for the Boone and Crockett Club and Foundation for North American Wild Sheep in 1999. This image also appeared as the cover of the book Return of Royalty by Toweill and Geist published in 1999 by these respected conservation organizations. Hand signed and numbered, the image area is approximately 13×13 inches. 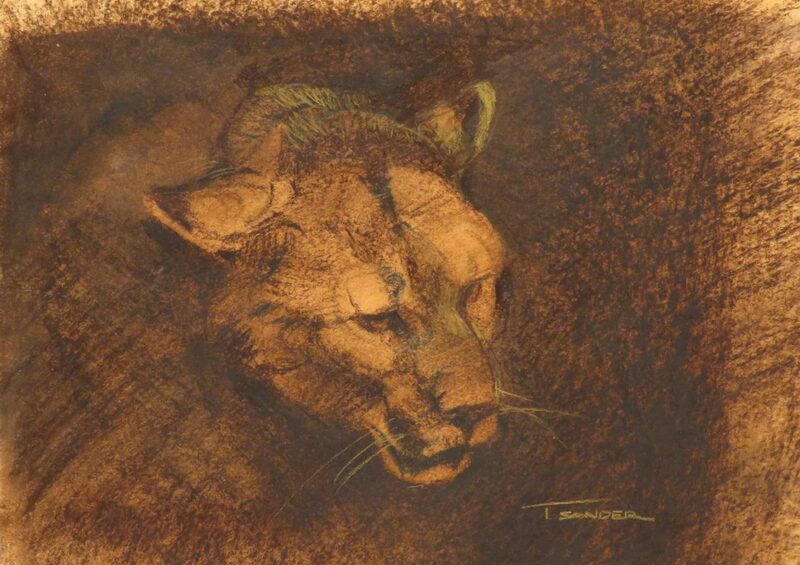 The print is slightly wrinkled in the matting, therefore a new matting is suggested. The price is firm. $300 plus shipping. Proceeds benefit the Boone and Crockett Club. 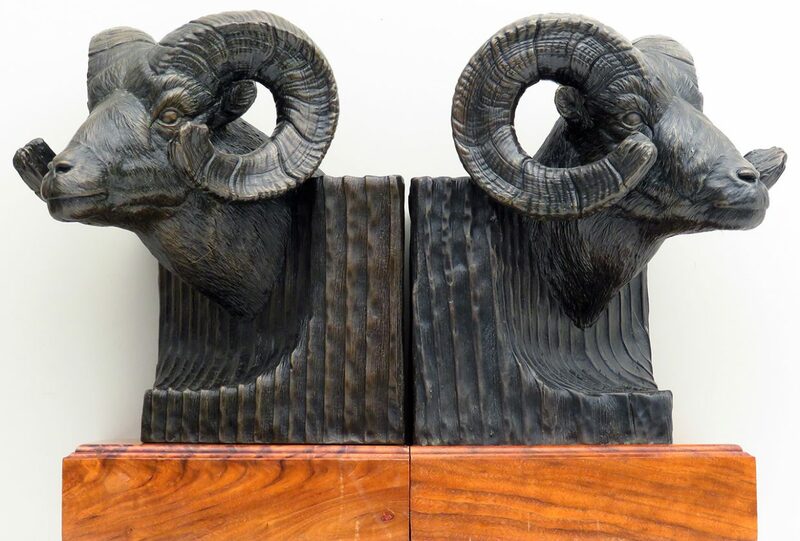 James L. Clark’s 1926 Ovis Poli from the Russian Pamirs as observed on the 1926 Morden-Clark expedition, recast from an original (8/30) and wonderfully reproduced. Approximate dimensions, including walnut base, are 18x14x7 inches. The price is firm and layaway is available. $750 plus shipping. Proceeds benefit the Boone and Crockett Club. 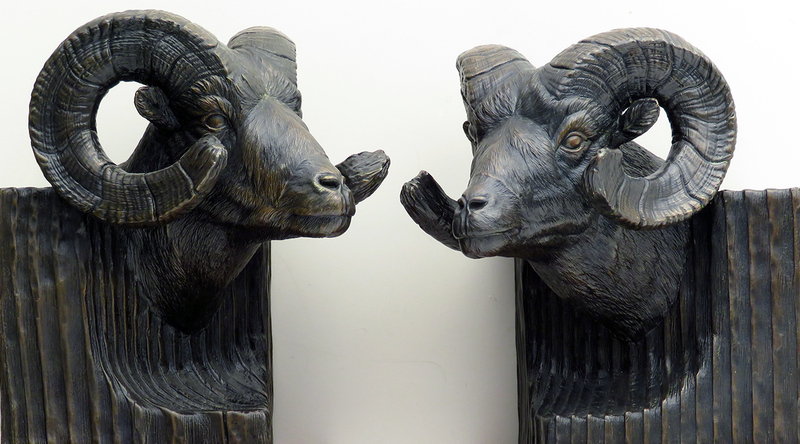 An untitled set of bronze Rocky Mountain bighorn sheep bookends by William Davis. Created in 1983, this is the artist’s proof (AP) set and is extremely well executed. Approximate dimensions, including bases, are 10x6x6 inches each. The price is firm and layaway is available. $1,250 plus shipping. Proceeds benefit the Boone and Crockett Club. 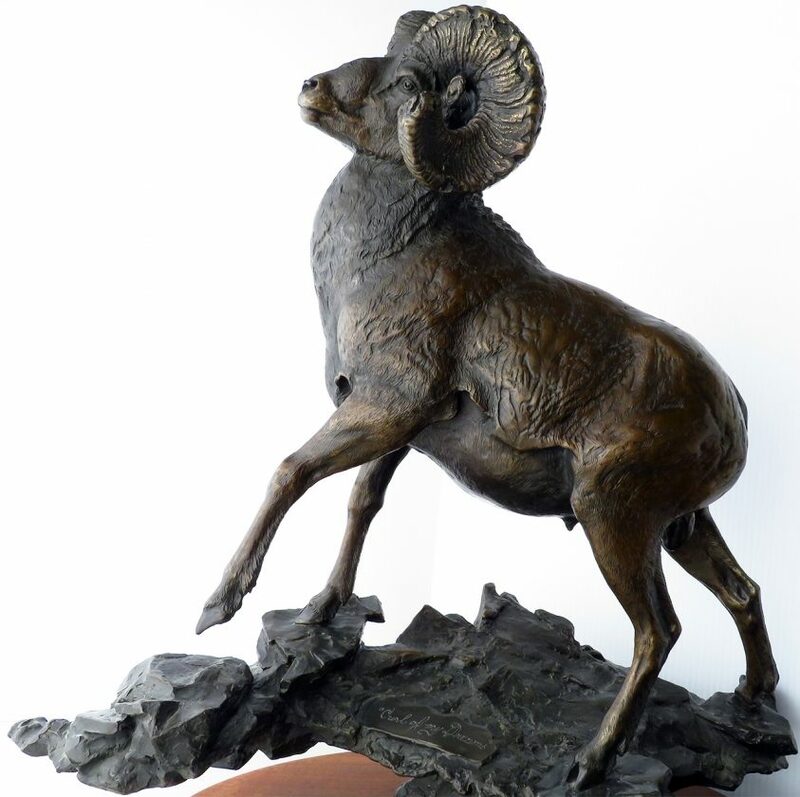 Commissioned by the Rocky Mountain Elk Foundation for presentation to the recipient of the Olaus Murie Award and created by artist Jack Logozzo, this wonderfully-detailed bronze is number three in the series. 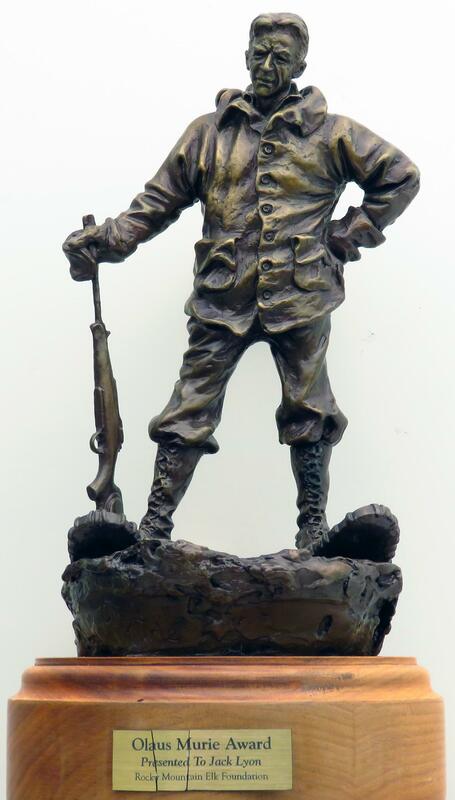 It depicts Murie, standing on a pair of big webs with his rifle cradled in a mittened hand – a pose no doubt inspired by his exploration of Alaska during the 1920s. DIMENSIONS: In approximate inches, 15 (H) x 8.5 (W) x 10.5 (D). CONDITION: Exceptional, other than the presentation plate on front of base being cracked. 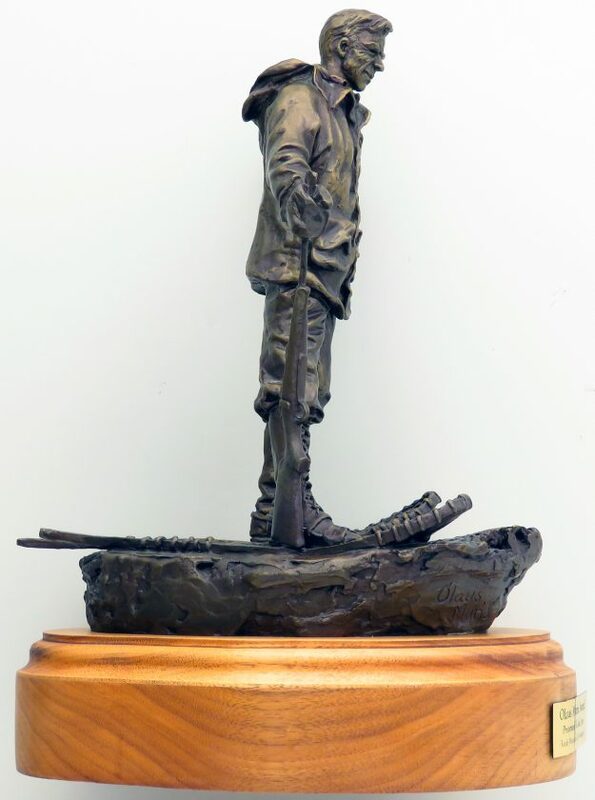 INCLUSION: Photocopy of article from Nov/Dec 2004 issue of Bugle Magazine detailing the presentation of this bronze to L. Jack Lyon, one of the fathers of modern elk management. The price is firm and layaway is available. $1,000 plus shipping. 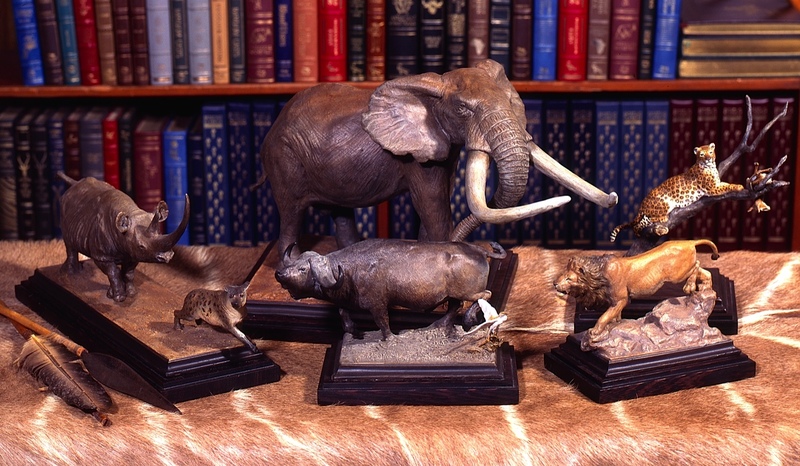 McGlaun, Bill, set of eleven bronzes of the world record trophies from eleven North American big game species. 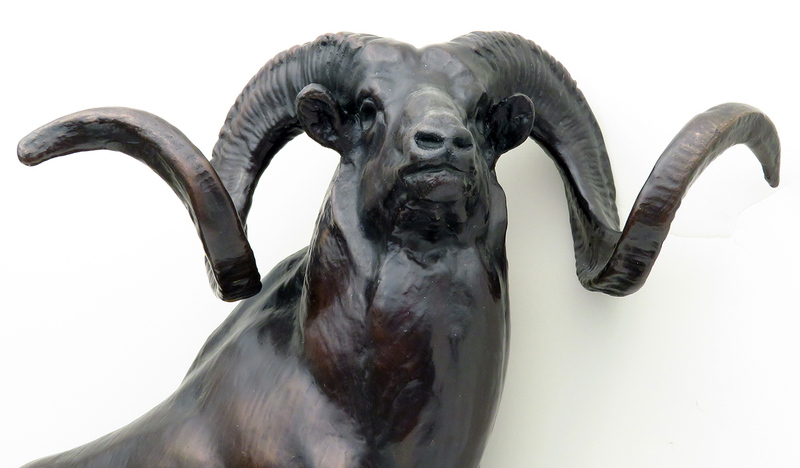 Commissioned in 1988 by Sporting Classics Magazine, these bronze were cast and then polychrome painted by hand to bring out the beauty and unique features of each animal. Only twenty four sets were sold (along with approximately thirty individual pieces), and a twenty fifth set, this one, was created for the director of the project. 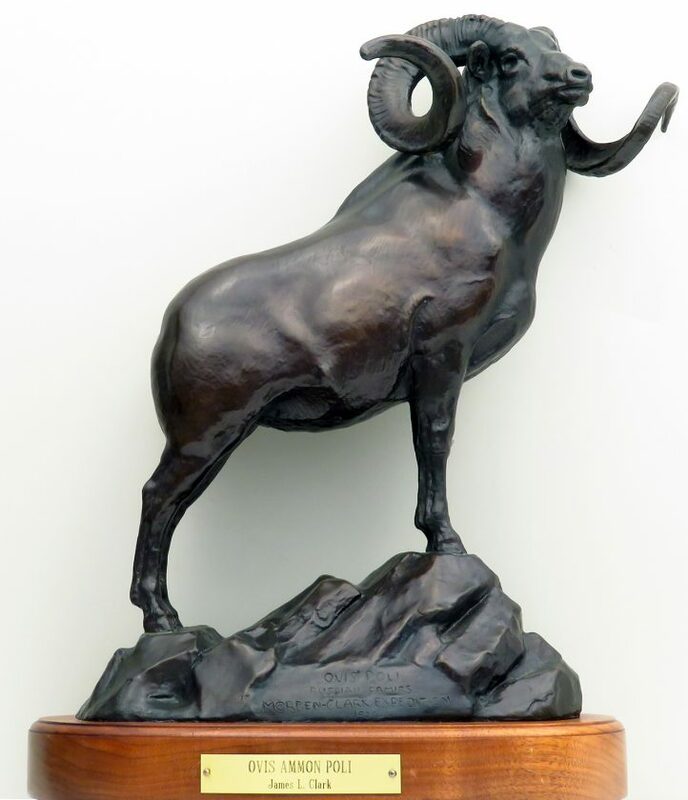 All four North American sheep (bighorn, desert, Dall’s and Stone’s) along with elk, mule deer, whitetail deer, moose, pronghorn, Rocky Mountain goat and caribou are represented. 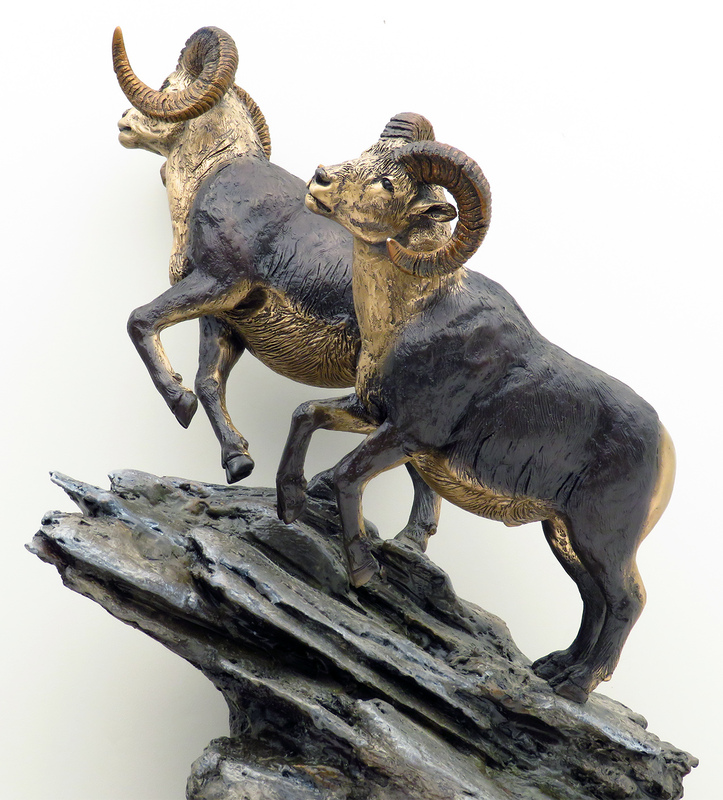 Standing atop a walnut base, each bronze is 6-9 inches long and up to ten inches tall. Each is signed and numbered, although the numbers do not match. A personalized letter attesting to authenticity will be provided to the purchaser. The price is firm and layaway is available. $4,500 plus shipping. 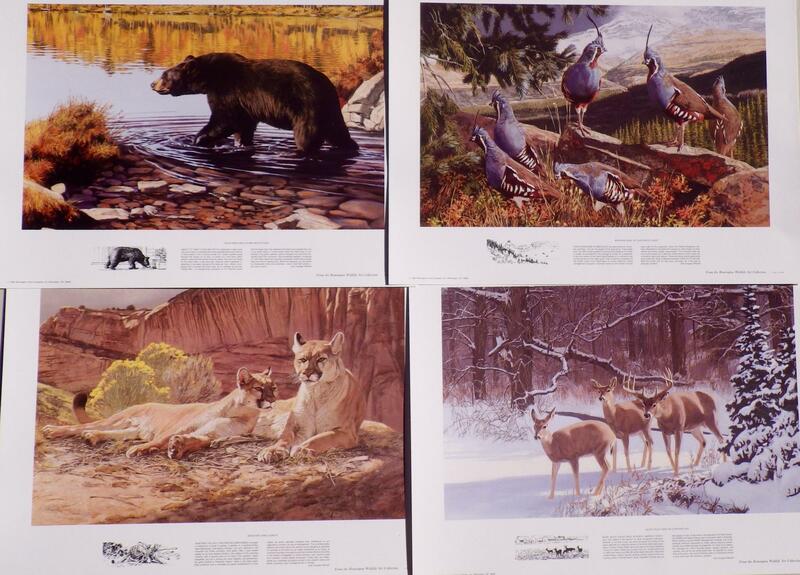 Set of four wildlife art posters from the Remington Wildlife Art Collection. 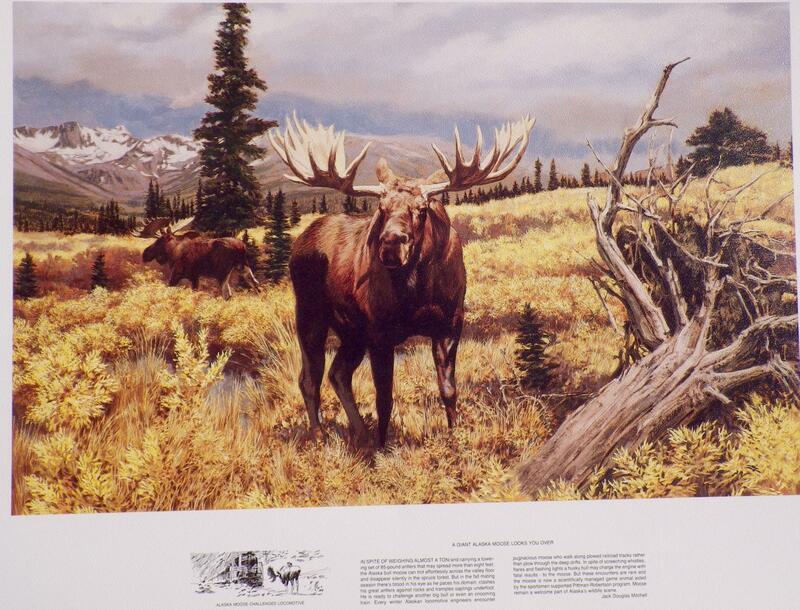 This 1991 edition features an Alaska moose, bobcat, blue-winged teal and a pheasant. 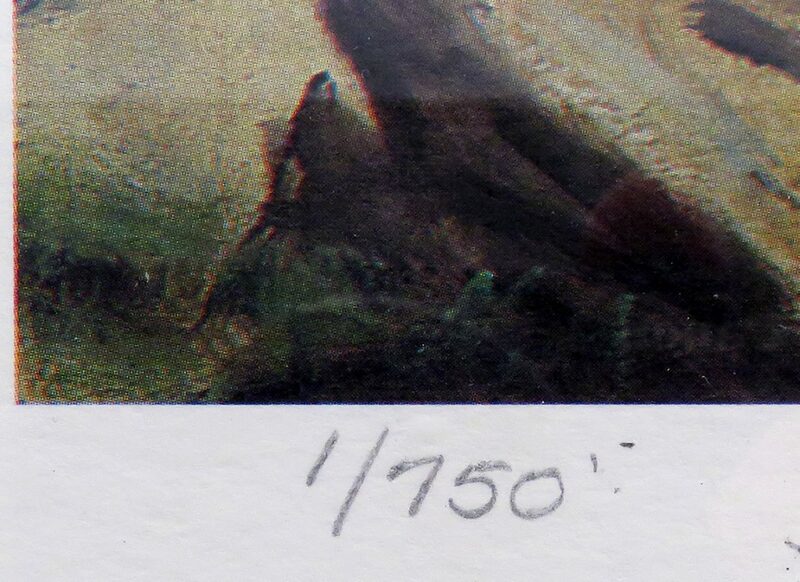 Image area is 9×14 with trim of 12.25 x 16.5 inches. Three sets of four are available. The price is firm. $60/set plus shipping. 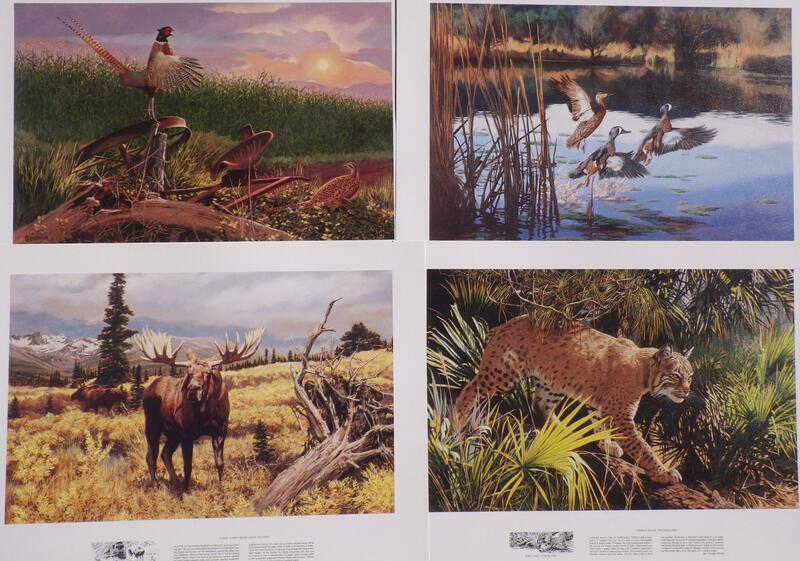 Set of four wildlife art posters from the Remington Wildlife Art Collection. 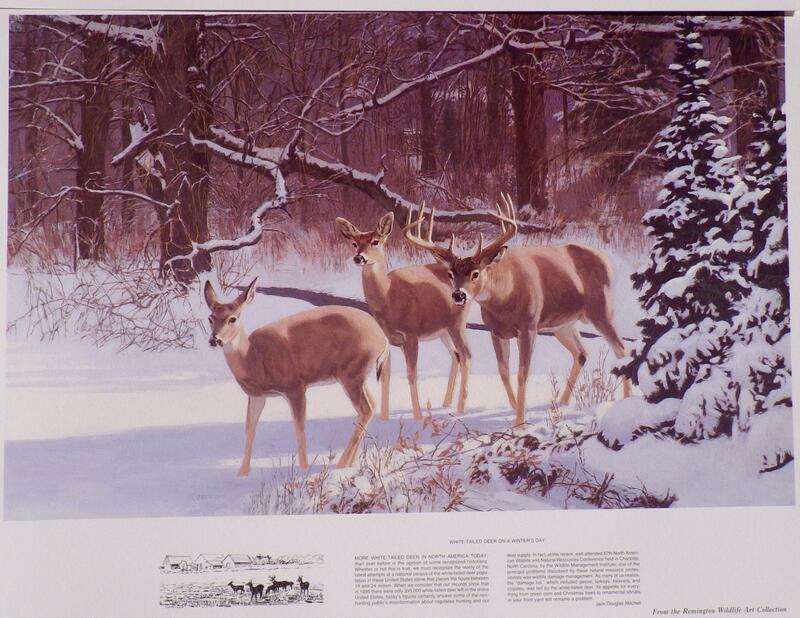 This 1993 edition features mountain quail, black bear, whitetail deer and cougar. Each image area is 9×14 with trim of 12.25 x 16.5. Five sets of four prints each are available. The price is firm. $60/set plus shipping. Rick Taylor “Warning on the Wind“, 15/48 as cast in 2002. 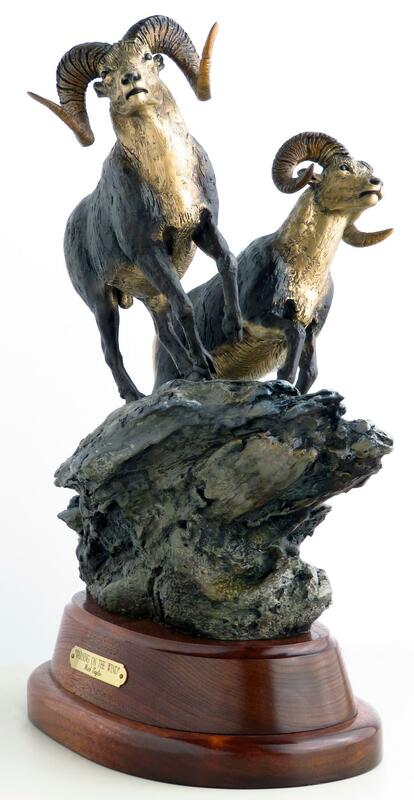 Inspired by the artist’s failed stalk, this dynamic work captures the movement and majesty of an old ram and his younger companion in the moment they became aware of a hunter on the mountain. Approximate dimensions are 16x12x10 inches, including the walnut base. Condition is exceptional, with scant evidence of display. Proceeds benefit the Boone and Crockett Club. The price is firm and layaway is available. $1,750 plus shipping. Curl Of My Dreams by Vince Valdez. 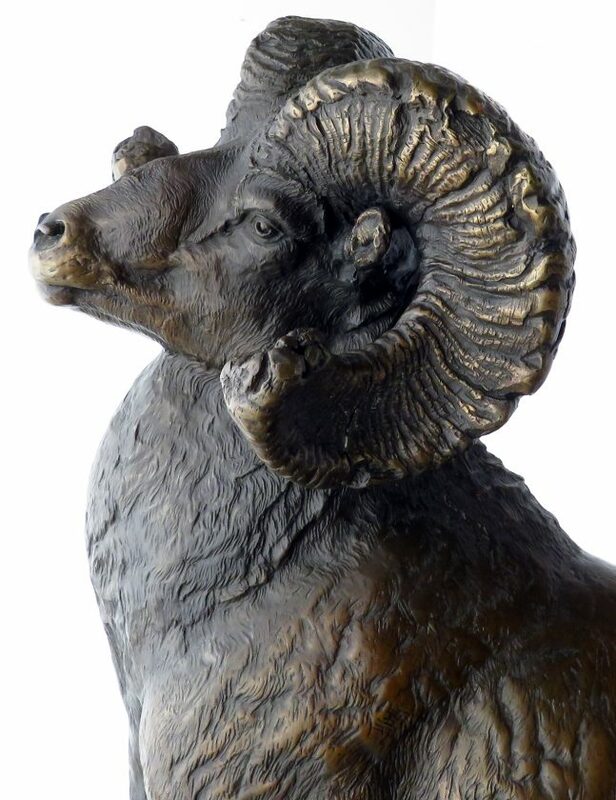 Superb rendering of a tremendous Rocky Mountain bighorn ram from 1984, this being number nine of an edition of twenty. Approximate dimensions, including walnut base, are 26x24x11 inches. SPECIAL SHIPPING: With a weight of approximately 60 pounds, professional packaging and shipping are required. Estimated cost of this service is $400 and will be paid by the purchaser. The price is firm and layaway is available. $2,000 plus actual packing/shipping costs. Proceeds benefit the Boone and Crockett Club.